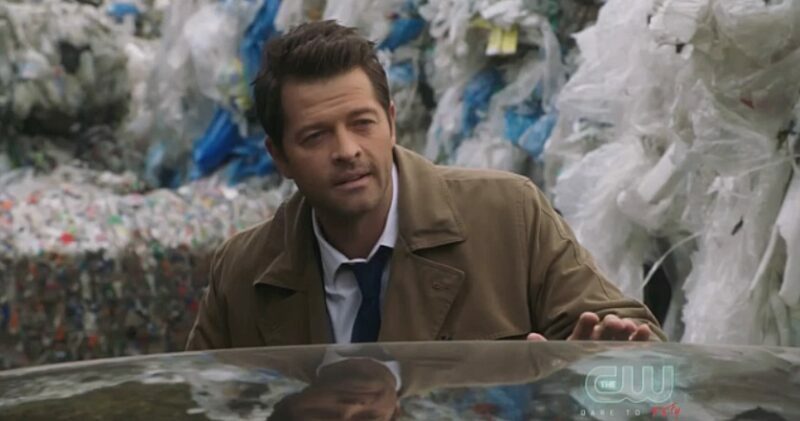 Misha Collins as “Castiel” in ‘Supernatural.’ Image courtesy of The CW. This week’s mid-season finale of Supernatural, “The Spear,” quickly reminded us that what we consider to be a Supernatural Christmas episode is on par with considering Die Hard a Christmas movie. Spoilers aplenty below, so be warned! The episode opens with “Rockin’ Around the Christmas Tree,” panning over an office building in Kansas City, Missouri, that is decorated for Christmas. The cheer is very quickly overshadowed by terrified screams and blood-splattered floors. Enter a Santa hat-wearing vampire we come to know as Brett, chasing down our first-five-minutes-of-Supernatural cold open death and snapping his neck under a very strategically-hanging bundle of mistletoe. At the bunker, we see Jack in the kitchen adorably caught by Castiel eating a bowl of Krunch Cookie Crunch in the middle of the night. He immediately, and very seriously, asks Castiel not to tell Sam, since his health-nut father claims that the sugary cereal will rot his teeth. Castiel tells him he understands why it must be so difficult for him to sleep since his death and subsequent resurrection, to which he says is “something of a rite of passage” for all of them. Jack says that he is actually just worried about his mother and her safety in Heaven, since the Empty was able to get in. Castiel assures him that, while Heaven is far from perfect, Naomi would do anything within her power to protect it. Jack then asks why Sam and Dean can’t know about the deal Castiel made with the Empty, and Castiel explains that he just doesn’t want to burden them with it. Castiel reminds him that the Empty said it wouldn’t come for him until Castiel was truly happy, and he admits that with everything on their plate, he doesn’t see himself being happy anytime soon. “This life may be a lot of things, but it’s rarely happy,” Castiel laments. To lighten the mood just a bit, Jack asks Castiel if he is the one who took the decoder ring out of the box of cereal, and Castiel replies with the cutest and most damning “maybe”, disclosing to Jack that the ring’s secret password is “Cookietacular”. Sam worries about Garth’s well-being since he is the one who asked him to come out of retirement to work this particular mission, and Dean tries to be positive, reiterating that they have a spy and Michael’s location. Ketch calls in to let the boys know he has found the egg that can trap Michael, but he was ambushed and had to put it in the mail. It’s scheduled to arrive in two days, which of course is too long for them to wait, and the call ends in disappointment for everyone. Melanie brings Garth the power-up mixture and Michael sees that Garth does in fact drink it. Garth listens in as Michael and Melanie discuss how someone (only referred to as “she” at this point) was spotted at an abandoned recycling facility outside Omaha. We can deduce that the “she” is Kaia when Michael orders her killed and the spear destroyed. Back in the bunker, Sam has tracked down the egg at a facility in Missouri that’s closed for the holiday. Garth calls in to update Sam on what he overheard Michael saying about Kaia, the spear, and his plan to have his monsters destroy the entirety of Kansas City. The Winchesters split up to gather the items that could potentially help them with Michael: Castiel with Dean to retrieve the spear, and Jack with Sam to retrieve the egg from the post office. Cue all of our hearts breaking at Castiel’s silent acquiescence and words left unsaid. Dean and Castiel scour the empty warehouse for any signs of Kaia, discovering that she had definitely been hiding out there. They worry that Michael’s forces already got her, considering they had a head start. Sam and Jack retrieve the egg from the post office, but then Sam is promptly hit over the head again (I mean, honestly?!) with a baseball bat, and Jack is taken by Michael’s people. Michael appears and destroys the egg and knocks Sam out for good measure. Dean starts to wonder if they’ve been set up when Kaia appears, and Dean asks her again for the spear, explaining that they need it to potentially kill Michael. He tells her to kill him if she won’t give the spear up, since Michael will kill everyone he cares about if she doesn’t. There are people that I care about – my family – and they’re in danger. Michael, the one who tortured me, the one who tortured you, he’s gonna hurt them and kill them. And then, worse. Thousands will die. And the only thing in this world that will stop him is the spear in your hands. So if you’re not gonna give it to me, kill me. Kaia says that she wants to go back to the Bad Place in return for letting them use the spear. She felt safer there because, even though she was on the run, she knew what she was up against. She thinks Jack can help her return, unaware that he is now without his powers, and Dean agrees that he can help her if she helps them. She admits that she has people she wants to protect too, and she reluctantly gives them the spear and disappears again as Dean gets a call from Sam to tell him about Michael’s attack, the egg’s fate, and Jack’s kidnapping. Dean and Castiel agree to meet Sam at the hotel where Michael is, and Castiel desperately instructs Sam to not go in alone. Jack is brought before Michael, who talks to him about destroying Kansas City in his world and how messy it became, which is why he is trying his monster attack this time – to destroy the city from the inside. He claims that he and Jack are family, and that Jack doesn’t understand his power or the meaning of time yet, but he will if he sticks with him. But you…you’re just a child, a mere infant. For you, the past two years – the entirety of your existence – feel like eons. You don’t even know what time is. But you will. Real time, the time that makes mountains, that wipes out species. You’ll see it all…with me. Jack refuses, and Michael insists that his loyalty to the Winchesters and Castiel will fade over time. Jack isn’t convinced, making sure instead to let Michael know that his family will come for him. Sam, despite Castiel’s warning, enters the building alone and kills Brett first, then Melanie. He finds Jack and Garth, and the three of them leave the building. Once free, though, Garth starts uncontrollably “wolfing out,” claiming that Michael is in his head. Sam is forced to choke him until he is unconscious, and Dean and Castiel arrive shortly to the scene thereafter. They bind Garth and put him in the trunk until they can figure out how to help him. Castiel heals Jack’s injuries, and Dean makes a solid attempt to wield the spear in Kaia fashion. Spoiler alert: He can’t, but he looks perfectly dorky and adorable trying to do so. They put together a sort of plan of attack, even knowing that Michael will sense Castiel’s presence before they’re seen. Michael does sense Castiel and delivers a decent beating before Sam and Jack are able to distract him. Dean is able to sneak in behind him with the spear, and a fight ensues, but when he gets the opportunity to stab him, he pauses. His vision blurs, showing him flashes of Michael!Dean and Dean in an empty bar, and Michael smiles before his current vessel slumps to the ground. Dean promptly breaks the spear in two and turns, the transition back to Michael!Dean clear in his features. Michael!Dean claimed he left the door open a crack in Dean’s mind so that he could get back in whenever he wanted. He gave Dean the false hope that he was safe so that when he jumped back in, Dean would be buried and less likely to fight him – that he would “stop squirming”. Michael!Dean: Dean was…resisting me. He was too attached to you, to all of you. He wouldn’t stop squirming, to get out, to get back. So I left…but not without leaving the door open…just a crack. Michael!Dean: To break him, to crush and disappoint him so completely that, this time, he’ll be nice and quiet for a change. Buried. And he is. He’s gone. Michael!Dean claims that now he has a whole army ready for his command “…ready for this,” and he snaps his fingers to end the episode. What can we expect Michael!Dean to have done with his snap? Sic his monsters on Kansas City? Wipe out half the population on Earth? Wardrobe change? Tune in when Supernatural returns on Thursday, Jan 17 at 8/7c on The CW. Previous story Our 2018 ‘Supernatural’ Holiday Gift Guide!